Smoothie in a bowl, say what?? 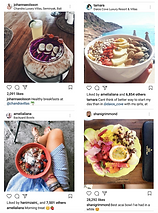 Ever scrolled down your Instagram feed and stumbled on photos of smoothie bowls strategically placed as a flat lay or photos of your friends grinning with their bowls? These photogenic bowls have been popping up everywhere in the world. As pictured below, you've seen your favourite style and lifestyle bloggers instagramming their bowls from all around the world. From Bali, to London to Melbourne, here are some of my favourite pictures found on the Gram. So... what's a smoothie bowl? First & foremost, we should introduce what REALLY is a smoothie bowl and why it's so popular as of recently. These are not your average smoothies. Rather than slurping them from a straw, they are eaten soup-like. Forget your eggs on toast & cereal, some have regarded them as the new breakfast 2.0 and gone as far as proclaiming it as the World's Best Healthy Breakfast. Smoothie bowls is the epitome of the phrase "beauty with brains"
It's both perfectly photogenic as well as providing a whole bunch of nutrients for your body. You can customise your own bowls to your nutrient needs and to your own personal preference. Love berries? Add them. They're packed with anti-oxidants. Want more calories? Add your favourite granola. Smoothie bowls is a well rounded meal, easy to whip out for breakfast and most importantly delicious. What's the key to make a good, healthy and pretty smoothie bowl? Your smoothie consistency should be froyo-like. 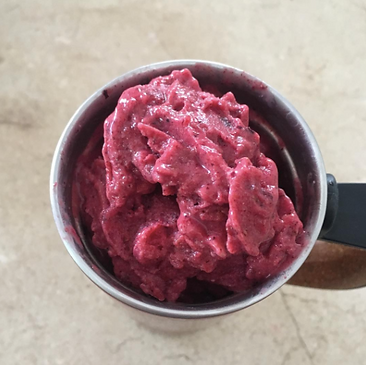 This consistency can only be obtained by blending frozen fruits. It's best to not add any water or ice because you'll see a water layer on top of your beautiful creation and it will melt faster. You don't want that! 2. Colours are key for photo-worthy bowls. Curating an Instagrammable bowl is like an art. To add colour and life to your bowls- play around with natural colours from fruits. For example, to get the neon and vibrant red- blend beetroot or add beet root juice to the mix. Below are some examples :) Choose a striking colour for the base and place different sliced fruits (e.g mango for its neon yellow) and superfood for the toppings as decoration. The simplest things are the most beautiful. Smoothie bowls can easily exceed 1000 calories. You need to pick the right mix of fruits and toppings which clocks less than 500 calories per serving whilst still giving you the high nutrient benefit. One great ingredient is acai. Don't know what is acai, here's an insight! First, it's pronounced as A-SIGH-HEE and not A-CHAI. Second, acai is a stone fruit that grows on the palm trees of the Amazon. It's omega rich in fat and its skin is a source of anti-oxidants. 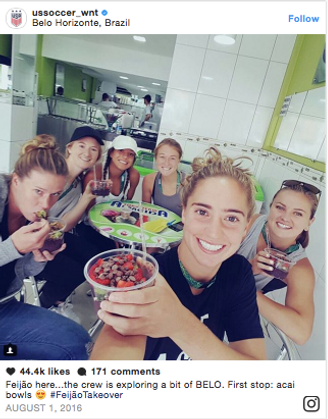 Fun fact, during the Olympics held in Rio de Janeiro, Brazil- Acai bowls were the preferred breakfast by the Olympic athletes. Down below is a picture of the US soccer team with their yummy breakfast. This health trend is popping everywhere in the world and you don't have to go all the way to Brazil to feel like an Olympian ;) In my opinion, smoothie bowls is not a short-lived trend- it's here to stay.